Brian Schueller’s MSBL roots go back to 1997 when he first appeared in the Mid-Iowa Baseball League located in Des Moines, Iowa. Since 1999 he has been a continual board member, league president/commissioner and currently serves as the vice president and webmaster for the league. 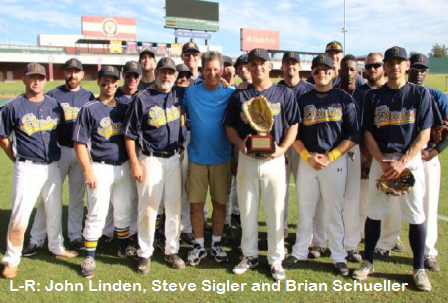 For his 20 years of service and attention to detail, MSBL Founder and President Steve Sigler has inducted Brian into the 2017 class of the MSBL National Hall of Fame. Like many of us, high school is where Brian’s baseball career took hold. “I attended a large 4A school in Dubuque and only tried out for baseball my senior year. I was one of two players cut from the team. The day I was cut, I hit my first home run during a scrimmage. That same evening, I hit my first home run in a semi-pro game, the only time I ever hit two home runs in one day.” Thus began his love for baseball and his amateur career.